In the first part of this article we configured Vagrant to execute two Ubuntu 14.04 Trusty Tahr virtual machines, respectively called pg and backup. In this second part we will look at how to use Puppet to set up and configure a PostgreSQL server on pg and back it up via Barman from the backup box. After defining the machines as per the previous article, we need to specify the required Puppet modules that librarian-puppet will manage for us. Although not essential, it’s preferable to use the option --verbose every time librarian-puppet is used. Without it the command is very quiet and it’s useful to have details about what it’s doing in advance. For example, without using --verbose, you may find out that you’ve wasted precious time waiting for a dependency conflict to be resolved, only to see an error many minutes later. Upon successful completion of the command, a modules directory containing the barman and postgresql modules and their dependencies (apt, concat, stdlib) will be created in our working directory. In addition, librarian-puppet will create the Puppetfile.lock file to identify dependencies and versions of the installed modules, pinning them to prevent future updates. This way, subsequent librarian-puppet install runs will always install the same version of the modules instead of possible upgrades (in case an upgrade is required, librarian-puppet update will do the trick). With the lines we’ve just added, we’ve given Vagrant the instructions to provision the VMs using manifests/site.pp as the main manifest and the modules included in the modules directory. This is the final version of our Vagrantfile. # IMPORTANT: Please do not edit this file as it is managed by Puppet! it2ndq/barman generates a private/public keypair in ~barman/.ssh. However, automatically exchanging the keys between the servers requires the presence of a Puppet Master which is beyond the objectives of this tutorial (it will be part of the next instalment, which will focus on the setup of a Puppet Master and the barman::autoconfigure class) – therefore this last step will be performed manually. The last command outputs a long alphanumeric string that has to be appended to the ~barman/.ssh/authorized_keys file on backup. The Barman configuration used so far is very simple, but you can easily add a few parameters to site.pp and take advantage of all the features of Barman, such as the retention policies and the new incremental backup available in Barman 1.4.0. We use the Puppet file resource to create a .pgpass file with the connection parameters and a cron resource to generate the job to run every night. 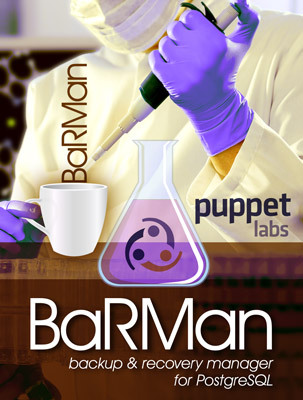 Finally, we edit the barman::server to add the required Barman parameters. With 51 lines of Puppet manifest we managed to configure a pair of PostgreSQL/Barman servers with settings similar to those we might want on a production server. We have combined the advantages of having a Barman server to handle backups with those of having an infrastructure managed by Puppet, reusable and versionable. In the next and final post in this series of articles we will look at how to use a Puppet Master to export resource between different machines, thus allowing the VMs to exchange the parameters required for correct functioning via the barman::autoconfigure class making the whole setup process easier.